Corporal Alicia Wong thrives on the front lines. She doesn’t like the war, but she likes the challenges and the clear-cut goals. She likes knowing who her friends and enemies are, too. Yet after uncovering evidence of alien contact in violation of Union laws, Alicia finds herself in a world of espionage and covert missions. Before it’s all over, her choices may change the course of Archangel’s war – and humanity’s future. NO MEDALS FOR SECRETS was released this June in ebook and paperback. Audio is now available! While Tanner Malone plays a role in this novel, the primary protagonists are Alicia Wong and Gunny Janeka. Given the gender shift in POV, I requested Tess Irondale as the narrator. Tess regularly knocks it out of the park with my GOOD INTENTIONS books, so I figured she’d be perfect for this job. 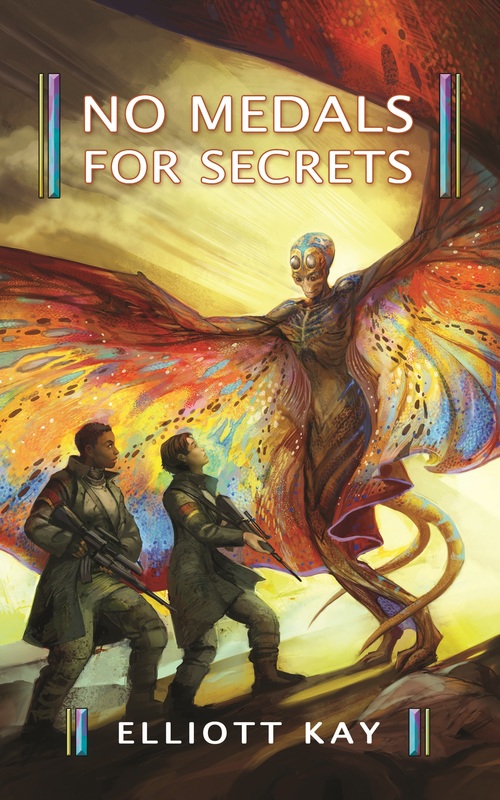 NO MEDALS FOR SECRETS takes place immediately after the events of RICH MAN’S WAR, essentially making it PMF 2.5 …but I can’t get Amazon or Audible to number it like that. I’ve marked it PMF 4 so readers don’t miss it.